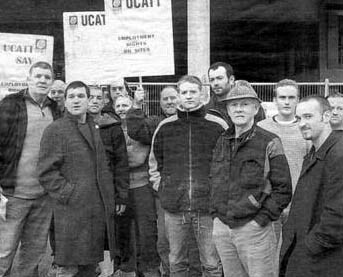 Pamphlet about the UK rank-and-file Building Worker Group within the UCATT union, published as issue 8 of the series Revolutions Per Minute. Issue 8 is dedicated to the 3,000 building workers who have lost their lives in so-called ‘site accidents’ since the advent of the Health and Safety at Work Act in 1974. In the year 2000/1 there were 120 deaths on site. Murder, in fact, would be a better word. It gives me great pleasure to welcome readers to issue 8 of RPM, particularly as it is so good. As secretary of the Building Worker Group Brian Higgins has been involved in many of the struggles waged by building workers in the last 25 to 30 years for better pay and conditions. As a result he has been maligned and attacked by the building employers, both large and small, agencies of the State and the trade union bureaucrats, not to mention many of their supporters on the ‘revolutionary left’. A the struggles waged by building workers in the last 25 to 30 years for better pay and conditions. As a result he has been maligned and attacked by the building employers, both large and small, agencies of the State and the trade union bureaucrats, not to mention many of their supporters on the ‘revolutionary left’. This issue of RPM gives Brian, and the building workers he represents a chance to put ‘their side of the story’. As such whilst it is a historical document it is also a ‘call to arms’, for action now to prevent injuries and deaths on building sites, improve pay and conditions and ultimately, for workers self control of the building industry. Whilst primarily aimed at building workers the issues raised in the following pages affect all workers and as such the reader will find RPM 8 invaluable. Chapter 8: Conclusions - moral to the whole tale? Chapter 8: Conclusions- moral to the whole tale?